We provide complete Title 21 CFR Part 11 Assessment and Compliance service for any of your products having electronic records and signatures. The purpose of Part 11 Regulation Issued by FDA is to establish criteria for electronic recordkeeping while maintaining FDA’s ability to protect and promote public health. FDA’s two major areas of concern are Data Falsification and Data Security. There will be productivity increase and cost savings of more than 60% using our service. Your company will save money from several thousand to millions of dollars adding to your bottom line profit. We define the technical and procedural controls that companies must apply when records required by FDA regulation are maintained in an electronic format. In some situations, both types of controls may be required. 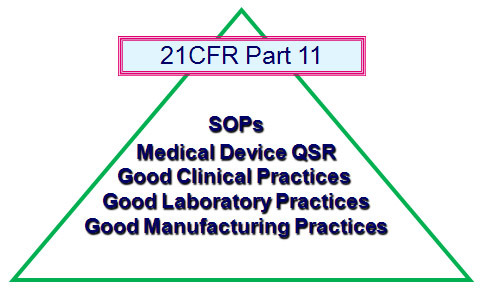 Title 21 CFR Part 11 final rule provide criteria for acceptance by FDA, under certain circumstances, of electronic records, electronic signatures, and handwritten signatures executed to electronic records as equivalent to paper records and handwritten signatures executed on paper. These regulations, which apply to all FDA program areas, are intended to permit the widest possible use of electronic technology. Who is affected by Part 11? Applies to all signatures required on these records or those signatures that are not required but appear in the records. You need to go to the other regulations to determine if you need to have a specific record. If you do, and you want to maintain that record electronically rather than on paper - part 11 tells you what you must do for that record to be accepted by FDA. Same is true for signatures. This section is intended to provide guidance on the use of the any product in relative to compliance with the Electronic Records / Electronic Signature rule (Title 21 CFR Part 11). To fully meet the intent of the rule, both the product design and the operational practices of the FDA-regulated firm must be properly addressed. This guidance describes the elements of the product’s design that promote compliance, as well as outlines the recommended practices to be incorporated within standard operating procedures by the firm. The main intent of this version of the section is to define the basic statement of work required to fully comply with the rule without imposing undue manual procedures on the regulated customer. Electronic Signature: means a computer data compilation of any symbol or series of symbols executed, adopted, or authorized by an individual to be legally binding equivalent of the individual's signature.